So I had some dragon eggs I needed to display. (No, I’m not kidding.) I found the perfect solution! 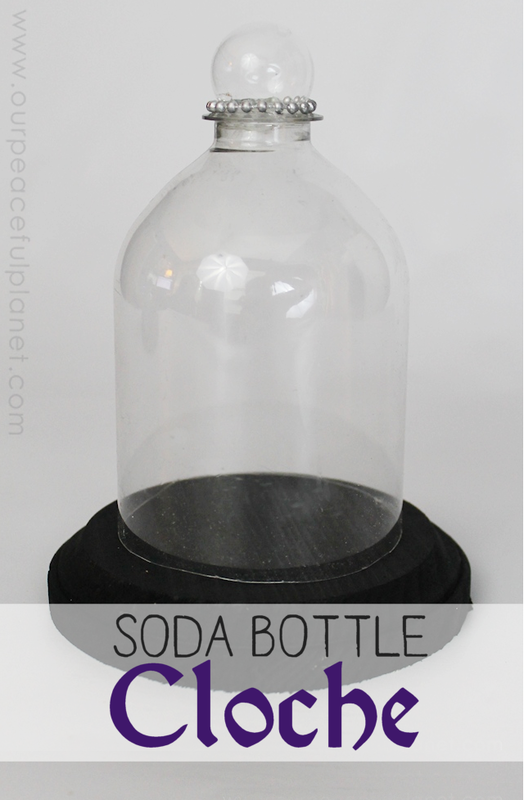 Cloches made from plastic soda bottles. (Also known as Bell Jars.) This is one of the coolest ways to recycle and upcycle something! They are very simple to create, the most difficult item to find being the top round handle. I only found one source that worked which was an Etsy shop. They were a little pricey so I also show a version made with regular wood balls found at any craft store. If you find something cheaper and easier that is clear and round please share here in the comment section. The bases are wood rounds also found at a craft store. They didn’t have the exact size I needed for the larger bottle so I asked my dad to cut me some wood rounds. Very easy if you have the tools to do so. I’ve seen the bases made from two circles cut from black foam sheets and glued together. Those looked sloppy to me so I opted for the wood. I also did not have the best saw to cut the top off screw part off the bottle so it was a little rough looking. I put some trim around to help cover it. Using a miter box or a better saw would help. You can’t cut that part with an X-Acto knife. Its way too thick. Below you’ll find a list of all the tools and options. I’m the queen of making do so if you don’t have a specific item find something else that works! I am SO glad I ran across your idea on Pinterest! Your instructions are great and your idea is genius. These are just what I need for my witchy dolls. It just so happens I ran across a bag of the wood balls in my stash and wondered how to use them. It’s serendipity is what it is. Hiya Nancy, I just love your idea !! I have come up with a few ideas for the handle but there are some other clever crafters out there too. What about some seashells ? Maybe the type with the snails in them that are round (which could also be painted)? Hi Faith! You know that’s a very clever idea. Never would have thought of it. Thanks for sharing it and for stopping by! Wanda, does the plastic from the bottle not stick to and mar the iron surface? walmart sells knee Hi hose in a small round clear container. Works perfect for the top. Filled the knee Hi’s with packing peanuts and glow in the dark spiders. used the plastic container for top on cloche cost 33cents. I will have to try this! For the top handle, thinking ping pong ball… thoughts on that? Thanks! I actually thought of that but it seemed a tad too large. It would work though! The tops from the small jar candles at dollar tree fit the bottle top perfectly don’t even have to cut neck off it covers it. I love these!! Thanks bunches!! A duh moment but I chalk it up to my hunt & gather (then hoard) instincts concerning all things cake stands, pedastal & cloches!! If using Christmas ball ornaments, I would use the plastic ones. Probably what others were thinking but since it hit me post sentence, maybe other readers think glass 1st, too. Depending on what will be beneath, a pretty rock might also work. Top 5 favorite pin/find for me!! Hi Shan! Thanks so much! That’s a great idea! You can take a clothes iron and level the bottom up, It’ll make it curve in a little which will give you a good edge to glue down or just make it stronger and sit better. It’ll just smooth them saw marks away on the top too. I love these. Great idea. How did you get the plastic to look so clear! I have used soda bottles before and they always are opaque looking. Would love some help on this! Amazing job! Thank you!!! I’m going to make some this weekend! Hope they turn out as great as yours! I have a bag of differently sized marbles, one of which is a green large marble that would look fab with fairy lights. Thanks! Very good idea! I tried to find large marbles but couldn’t’. For the top knob, Use an old Christmas ball ornament turned upside down instead of purchasing glass balls. What a wonderful idea!!! Thanks so much Diane. I’m going to add that into the post! Love this idea!I Read that you could use bleach inside the Christmas balls to remove the paint.